Soft colors fill the sky at sunset where a glass of wine sparkles atop the rocks from the shoreline of Green Point in Newfoundland Labrador, Canada. Large rocks span across the coast at Green Point in Gros Morne National Park in Newfoundland Labrador where you can enjoy a glass of wine and watch a stunning sunset. The soft hues from the sunset are slowly diminishing as evening nears which will take away from the sparkling light in the wine. 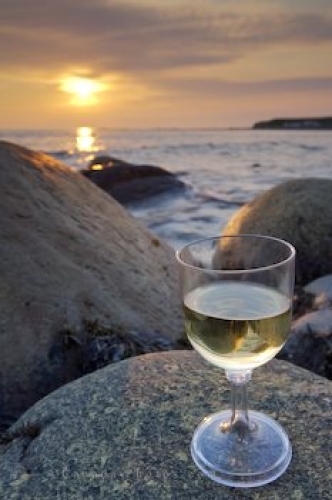 Photo of a glass of white wine sparkling in the sun rays at sunset at Green Point, Newfoundland.